Dubai, UAE, April 2, 2018: The kids are alright at Symphony Style Hotel Kuwait, the jewel of Kuwait City! Inspired by Symphony Kids’ Club position as the entertainment destination of choice for young in-house guests, a play destination and party venue for kids in Kuwait, Symphony Style Hotel Kuwait has introduced a dedicated Party Room & Teens Hub to accommodate the high demand for children’s birthdays and provide teens with a new place to hang out and celebrate. Situated on the newly-renovated 3rd floor, the Teens Hub is a dynamic entertainment zone exclusively for teenage boys and girls. 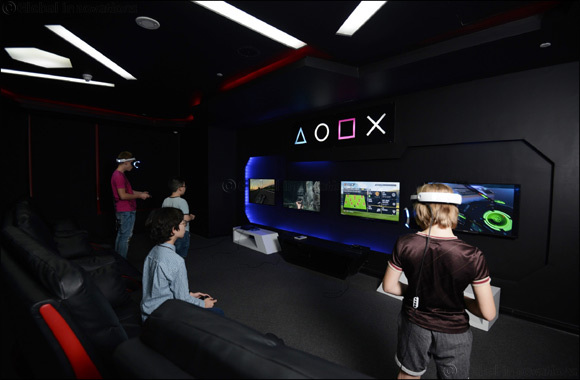 Guests of the Teens Hub can indulge in the latest video games for Wii and PlayStation and the Interactive Magic Motion virtual reality experience or simply have a special birthday celebration that is filled with action and excitement. The Party Room is a functional indoor space ideal for children’s birthday parties and family celebrations, with special party packages available tailored to every child’s needs and requirements. Symphony Style Hotel Kuwait’s attentive staff will be available on end to ensure a memorable occasion, whether they are hosting little superheroes, mini princes and princesses or little wild animals. Furthermore, packages start at reasonable prices starting at KD 195. Symphony Style Hotel Kuwait is committed to ensuring memorable experiences for all guests. The addition of the Teens Hub and Party Room emphasize how much the hotel values young guests and demonstrates why it was named the Best Luxury Family Hotel in Kuwait. The Symphony Kids’ Club offers a 500 sqm multipurpose play area, a dedicated cinema, library, dining and sleeping area. Young guests are under the constant supervision of our trained staff, ensuring peace of mind for parents and an exciting adventure for children. Schools and nurseries can benefit from an exclusive package for their field trips as well and have special offer tailored for them. With only KD 5 entry fee per kid, the kids are welcomed from 9am to 1pm to play and have a fun-filled time in Symphony Kids’ Club in addition to snack meal, popcorn, juice and fantastic activities.